The Charleston-based Psychedelic Foursome Will Perform in Richmond for the First Time in 8 Years! tomatoband began its intrepid journey in a cold, but soulful basement in Richmond, Virginia. 2010 was the year and Budweiser the beer. Alex and Charlie were home from college on "holiday" and decided to meet up for a night of drinking and music. Sparks flew, the fuse was lit, and music as we know it here on earth would never be the same. After many lengthy jam sessions and focused garden parties, the band began to take shape. Alex held down the bass and drum sections on the fabled Casio ToneBank keyboard while also adding top-end textures like the much acclaimed "sirens" sound, and Charlie maintained a striping lead guitar tone laden with heavy, effects driven sequences. The band was to release two albums and play several shows that fall, all of which passed completely under the radar (more like over the heads!) of critical acclaim. The first disc, self titled but endearingly known as "Red Tomato", was cut of five songs and passed out to a few lucky faces at a Phish concert in Charleston, future home of the band. This EP was completely overlooked although it introduced several tunes that would remain in the repertoire indefinitely. "Red Tomato" was quickly followed by the crowning studio acheivement of the fall, naturally named "Green Tomato." After the release of "Green Tomato", and many late-night rehearsals in the basement, the band went looking for gigs and found them in the most extraordinary places. The first performances were outdoors in mid-December (bring your mittens!) and saw some of the finest jams of the season. Notable moments came when the band played an impromtu show for the homeless at Monroe Park in downtown Richmond, and outside of the Happy Corner on Main Street. A tape exists of the Monroe Park show on which the cold weather was unable to quell a scorching "Washed-Up Pimp" that defined the times for the band, fearless use of effects and dirty digital funk. More fun was to be had on New Year's Eve that year when tomatoband graced a massive private house party downtown. The energy that night was undeniable although a hostile crowd boldly threatened the band with Kanye West (great choice right?) cranked over the stereo. Never ones to back down from a challenge, the band initiated an intense feedback/effects jam that solidified their onstage persona and became affectionately (and appropriately) known as "Tomatoband vs. Audience." Taking it out on the audience would become a hallmark of almost every tomatoband performance to follow. A week later, Alex and Charlie departed Richmond and took tomatoband with them. Now, almost eight years later, tomatoband has grown on the vine. Bass and Drums, courtesy of Alan and Jake, help propel the band into the touring act that is ready to make it’s triumphant return to The Mond! 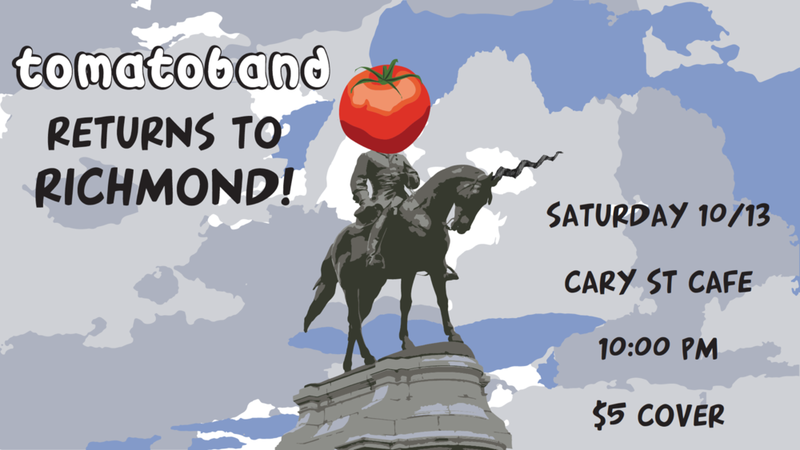 Catch tomatoband at Cary St. Cafe on Saturday, October 13. Doors at 9…show starts at 10.